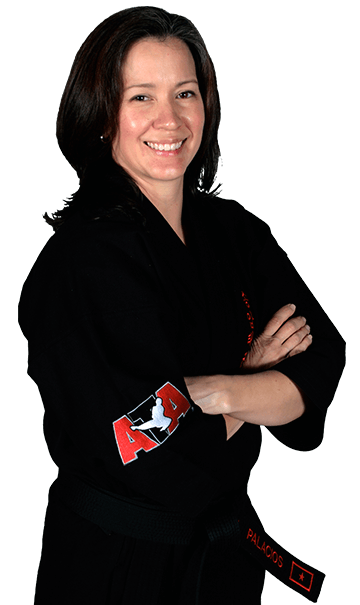 Hi, my name is Master Annette Palacios and I am the owner of Master Palacios ATA Martial Arts. While attending college at the University of Notre Dame, I began my martial arts journey and the positive impact it had on my life was remarkable. It was always my dream to someday own my own school, and when I opened Master Palacios ATA Martial Arts in 2000, I made a commitment to our community in Austin to create an enjoyable environment for students to improve their fitness while building confidence they can carry into their everyday lives. Our children's martial arts program creates leaders. We do this by teaching the same values you teach at home. Our adult program is second to none. From traditional martial arts to more modern self-defense styles, there is something for everyone at Master Palacios ATA Martial Arts. If you are looking to burn major calories, learn self-defense moves and get in the best shape of your life, you must come and check out our program. I signed my grandson up to have "our" thing to share. Before long, I signed up for self defense here as well. Now I'm at the point off wanting to be here every day to be around the positive atmosphere, training and overall friendship. This was by far the best decision I've ever made for my family. This is a fantastic martial arts school, offering a variety of options for not just becoming more fit, but also improving your life. My family have been members for almost 2 years now and it has been awesome watching my kids grow stronger, more confident, and more respectful, as well as improving my own strength, confidence, flexibility, and health. I highly recommend this program to individuals and families looking to get in shape, improve attitudes, and have FUN! Palacios ATA Martial Arts is the most rewarding extracurricular program in Austin I have found for my children. While we first enrolled them in ATA for the self-defense, we quickly learned that our kids were learning subtle lessons about such topics as self-esteem, respect, leadership, bullying, selflessness, etc. While I think most parents try to teach these same things to their kids on a daily basis, the professionals at ATA are able to message much more effectively than I can. When we have a "teaching moment" at home, my wife and I are often able to use the ATA lessons as a reference point they understand. And my kids have never been more motivated to stick with an extracurricular activity - each is determined to get a black belt. I should mention, the gym was recently renovated, which allows me to watch comfortably (and knock out urgent work with on the wireless network - yeah, sometimes I'm that parent). Bottom line: As a life-long boxer, I enrolled my kids in Tae Kwan Do so they would have exposure to a form a self-defense. While they have certainly learned to defend themselves quite effectively, the reason why I will remain so loyal to ATA is the life-skills that my children are learning. We love Ms. Palacios and Palacios ATA Martial Arts! Our first grader started taking taekwondo (TKD) lessons from Ms. Palacios one day per week in his after-school program at Magellan International school. We were so impressed with the resulting positive changes in our son, we soon had him attending additional evening and weekend classes at her studio on South IH 35 between Wells Branch and Howard Lane. He's preparing to test for his 3rd belt in just a few weeks and TKD has become a huge part of our family life. The gym space in a North Austin industrial park is nothing fancy, but it has everything a TKD student at any age from 3+ needs to progress, especially caring, knowledgeable, and motivating instructors. While Ms. Palacios (5th degree black belt with 20 years of experience) is the owner and primary teacher, there are several other advanced black belts on staff (all of whom have undergone background checks) who take turns leading different aspects of each class. Further, during each class, students at all belt levels are challenged to take on responsibilities and lead small groups of others below their belt levels, a great way to foster leadership skills. Beyond the fitness, self-defense, and discipline aspects of TKD, Ms. Palacios emphasizes academics, leadership, and good citizenship. She even teaches bullying prevention at local schools and incorporates many of those lessons into her TKD classes. Another thing we love about Palacios ATA: they offer summer and school holiday day camps for elementary school ages. These camps aren't just about martial arts and character building, but also offer other fun activities like tumbling, inflatables, and popcorn flicks with a good lesson. I've been so happy with the positive experience for our child, I'm now considering taking up lessons myself. When I do, I'll update this review with more info on the adult TKD beginner experience at Palacios ATA. 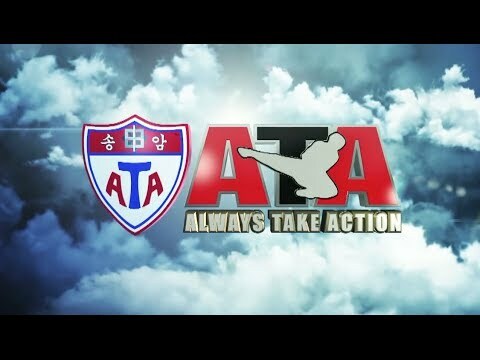 Note: this business has another listing as ATA Blackbelt Academy, but it is the same gym as Palacios ATA. I've asked Yelp HQ to merge the two pages, but that may take a while to happen. My 5 year old daughter was telling me a story about a kid experience in school. It was unpleasant and involved some boys pinching her. She said, when the teacher was talking to the boys she knew the boys were lying to the teacher about what happened. I asked her how she knew they were lying? She said, "I was watching their eyes move and well, they sounded scared." I asked, well, maybe they were scared and that is it, maybe they were not lying. She says, "in Karate class, they taught me this, speak confidently and hold your head up. I use to hold my head down, (demonstratively) like this. But, when I know something and when I am confident, I know I am telling my truth." This was from a year ago and she reamains a student of ATA through Magellan International School. When we re-register and ask her what she would like to do after school, Karate is always first on her list. She now has an orange belt and is super proud of her accomplishments in class. We love Ms. Palacios and ATA. The after-school Tae Kwon Do program (at Magellan International School) has been wonderful for our kindergarten-aged daughter. Although we originally enrolled our daughter to pick up some basic lessons in self-defense, she has learned so much more in just a half a year in the program. At first, our daughter thought the program was not right for her; "it's for rough boys," she said. And after the first class, she didn't want to attend future classes and refused to participate. Ms. Palacios immediately informed us about our daughter's progress and asked if we wanted to keep trying. We said we did. Through gentle patience and positive reinforcement, Ms. Palacios and her instructors brought our daughter into the class and won her over to Tae Kwon Do! Our daughter absolutely loves it now! And she has learned (and continues to learn) wonderful, valuable lessons about perseverance, trying new things, discipline, hard work, and (of course) self-defense. We could not be more impressed with the quality of the program and the instructors leading it. My 6 year old son has been attending for a little over four weeks and his behavior at home and school has improved so much. I really enjoy watching Ms. Palacios teach class because you can see the passion she has for all that she teaches. I love that her classes teach life skills she is able to teach things to my son that I have tried several times but since it's not coming from me he has finally picked up. She has helped raise my sons self confidence so much since he has started. He remembers his class schedule and reminds me that he needs to be on time every time. I'm so glad Ms. Palacios has entered into our lives as she has already made a huge impact on my son and she doesn't even know it. He strives to work hard and do well because he says she is someone who is very important to him. Nosotros estamos muy contentos con los resultados que hemos visto en nuestros dos hijos. Uno de ellos era muy tímido y las clases que ofrece Mr. Palacios han hecho que aumente su autoestima. El personal de la academia es servicial y amable, además de que algunos de ellos son bilingues y eso para nosotros en importamte también. Lo más importante es que nos sentimos como familia parte de esta comunidad donde la disciplina, la honestidad y el trabajo constante son partes fundamentales de la practica de artes marciales. Soy fan! Ms. Palacios is tough, motivating, and encouraging. I learned so much in my month of attendance. Looking forward to returning. "Ha!" Ms. Palacios, I wanted to share my tremendous thanks to you, your instructors and your students for all that you have done for Seth. Although you would not be able to tell today, but at 6 years old, Seth was a very shy and unassuming child, and honestly was not very confident. It was at age 6 that our family went through some significant changes that would have caused some issues for almost any child. At this point, my friend, Carmichael Simon, suggested that Seth start a martial arts program to help him get through this rough time. Carmichael, with his history in the martial arts, researched the right school for us to attend, and selected Palacios ATA as the school that Seth would fit in best at. Looking back, it was a tremendous recommendation. Over the past 1 and a half years, Seth has not only progressed as a martial artist, which is great, but the real progress was on this shy 6 year old to turn into a very confident, respectful child. Seth is currently aspiring to be the next big action movie star and you have helped teach him about setting goals, the work ethic and patience to achieve those goals and the confidence in himself to push forward. Seth recently performed a dance routing in front of 2500 people (and was awarded dancer of the year) and walks into ANY audition in front of agents and casting directors much more confident than the other kids. I have told you many times, but I sincerely thank you, not just for the martial arts that Seth is learning, but the life skills. It is going to carry him a long way in life and these are lessons that he will never forget. He will always be a confident and disciplined young man, who will be successful in life.